Avascular necrosis of the second metatarsal head can be a very difficult and troubling issue. The problem often occurs in children or teenaged athletes, and can make the continuation of sports activity difficult or impossible at times. We do not fully understand the underlying cause of the avascular changes but often consider chronic microtrauma to be a common source. A long metatarsal may also contribute to the underlying pressure and eventual cartilage collapse. If we pick it up early, the problem is commonly easier to treat. With time, there is collapse of the articular surface, making treatment more difficult. In my experience, I have begun to divide these cases into open growth plate and closed growth plate. In the open growth plate, I often will not perform any form of osteotomy or bone and cartilage transplantation as I do not want to alter the growth plate or damage it in any way. I will, however, perform spur removals on the dorsum of the metatarsal head, remove loose bodies and also perform pure cartilage transplantations. To protect the metatarsal head, I also may try a fully rigid soled orthotic with a metatarsal head cutout if there is minimal damage. In cases of severe damage with an open growth plate, I will protect the area with orthotics and shoe modifications until the plate closes, and then progress to more invasive procedures. In the case of closed growth plates, many more options are available. The goals of all the options are to decrease pain and continue to provide the highest level of function possible in the most minimally invasive manner. With the closed growth plate category of cases, consider the level of collapse, the remaining articular surface and the amount of bone loss and cystic changes. Procedures include joint modification, bone and cartilage replacement and joint destructive procedures, which include metatarsal head resection and joint replacement procedures. All of these have a place in the treatment of the metatarsal head but proper selection is critical for improved outcomes. 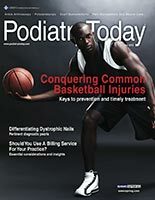 Common diagnostic studies include standard X-rays to see the overall contour and alignment of the metatarsal head. Secondary studies include magnetic resonance imaging (MRI) and/or computed tomography (CT) scans. We have often used MRI as our go-to study but have found the level of edema and swelling in the region limits visualization of the surrounding bone region. Therefore, we have begun to use weightbearing 3D CT scans as our go-to imaging study. This allows proper joint and bone visualization, and also allows preoperative alignment planning. After completing the imaging studies, we proceed to select the proper procedure. Often, we will select procedures based on the level of damage and what the remaining articular cartilage and bone surrounding the damage look like. We will usually try to perform joint sparing procedures whenever possible. Below is a list of procedures from the simplest to the most complicated. Joint clean up. Removal of loose bodies and spurring in the metatarsophalangeal joint (MPJ) can be a great help. Check this prior to surgery with a CT scan. Often, the articular surface is also loose and damaged. If one misses this, it can be a significant problem at the time of surgery. In many of these situations, the metatarsal head has collapsed and dorsal spurring with loose bodies prevents proper motion of the joint. Removal of such spurs allows for improved motion and less pain. One may add an amniotic membrane to prevent scar formation and this also acts as a cushion surface within the joint surfaces. Metatarsal osteotomy. Metatarsal osteotomy has been a mainstay for the treatment of Freiberg’s avascular necrosis for decades. The procedure often allows for replacement of the damaged dorsal cartilage with good quality plantar cartilage. Use a “tilt-up” type procedure by taking a dorsal wedge from the metatarsal neck. This allows removal of the dorsal damaged metatarsal portion and tilts the better plantar cartilage into the joint surface. Surgeons can achieve fixation with a single screw or crossed and buried K-wires in the metatarsal head. Again, it is essential to make sure the articular surface is stable and healed prior to a tilt-up osteotomy. Using an amniotic membrane wrap of the metatarsal head can improve healing and function. Cartilage replacement grafting. If there is minimal collapse and minimal cystic changes with cartilage damage, one can replace the articular surface with cartilage cells. If there are minimal cysts, first clean up the cysts and fill them with bone graft, which one can often harvest from the heel. Then use the morselized articular cartilage cells to resurface the cartilage damage. I have found the surgeon can replace up to 70 percent of the surface with a good outcome if the underlying bone is stable. Often, using an amniotic membrane to wrap the metatarsal head holds the cells in place and helps with healing. I also will often augment the cells with stem cells from the calcaneus through a bone marrow harvest spin to increase the healing potential in the region. This procedure can be very gratifying in the right cases. Bone and cartilage allograft. If there is large cystic bone damage with overlying cartilage damage, one can replace the region with bone and cartilage grafting. This is often called an osteochondral autograft transfer system (OATS) procedure. The surgeon removes a cylinder of bone and cartilage, and replaces them with a like cylinder of good quality bone and cartilage from a fresh allograft. In certain cases, one can attempt an entire metatarsal head replacement with plate fixation if there is complete collapse with bone loss that will not allow the plating of an implant. Make sure the patient is aware of the difficulty of bone healing with these procedures as the surrounding bone is often poor quality. Discuss metatarsal head resection as a long-term option should these procedures fail. Metatarsal head implant. I have found that improvements in metatarsal head implants over the past decade have made this procedure far better and more likely to have lasting results. My personal option is the HemiCAP (Arthrosurface)implant and I like the morse taper construct, which is secure and does not rely on the surrounding bone for function. The implant also allows for decompression in long metatarsal cases and lasts well with proper orthotic protection. Again, one must discuss metatarsal head transplant and metatarsal head resection as long-term options if the metatarsal head implant procedure fails. Metatarsal head resection. Metatarsal head resection can often be a good last resort for patients. In older patients, this may be the best option as it is simple and functional. In younger patients, attempt preservation of the joint if at all possible prior to resection. In cases of resection, remove the bone at the metatarsal head/neck region and place a filler to maintain length. My preference is to use a peroneal tendon anchovy procedure. I place a K-wire through the tip of the associated toe and drill to the base of the phalanx. I then place a tendon graft into the resected metatarsal head region and grab the graft with the tip of the K-wire. I then spin the K-wire until the graft rolls up on itself and fills the empty resection area. I subsequently pass the K-wire into the metatarsal head to hold the position. Remove the K-wire at three weeks. The tendon graft acts as a spacer and filler in the resection region. With adequate diagnostic testing and proper patient and procedure selection, one can treat avascular necrosis of the metatarsal head with good to excellent outcomes. It is critical to protect the contralateral limb and other metatarsals post-surgery as the cause of the avascular changes may not be clear and can occur in other metatarsals on the same or the contralateral foot. We often will use a rigid extension to the MPJs on an orthotic and suggest stiff-soled shoes as a precaution post-surgery. We also find that a return to activity with adequate protection has not been a problem in our recovered patients. Appointments are now available within 24 hours! Schedule an appointment with a foot and ankle expert now!